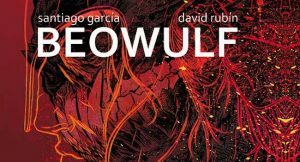 This past January, Image Comics brought Santiago Garcia and David Ruben’s graphic novel, Beowulf, to America. Kyle Willoughby and Claire White have been all about two things lately — fantasy books, and relating everything back to Tolkien. That makes this new adaptation a perfect excuse to discuss English literature’s oldest written fantasy and it’s place in modern culture. Claire begins by historically placing the English Vikings who told the story, before moving on to explain how J.R.R. Tolkien brought the poem out of obscurity and into the popular imagination. Kyle uses this comic as an opportunity to discuss what’s so special about its publisher, Image Comics. Our hosts conclude with their thoughts on the graphic novel and the power of adaptations.